Beijing's decision to impose anti-dumping duties on cars imported from America appears to be politically rather than economically motivated, but that will have minimal impact on the US car industry, say analysts and industry executives. Starting yesterday, the Ministry of Commerce began slapping punitive duties of between 2 per cent to 21.5 per cent on exports of United States-made big-engine cars and SUVs to China. That is in addition to the 25 per cent tariff it currently assesses on imported cars, the maximum allowed under the terms of its World Trade Organisation entry agreement. 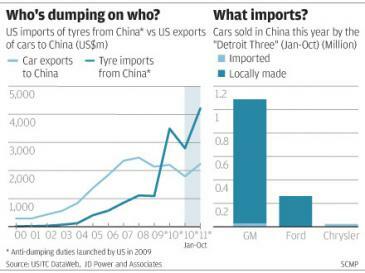 The move appears to be Beijing's retaliation after China lost its final appeal to the WTO in September against a 2009 US move to impose anti-dumping duties on tyres imported from China. 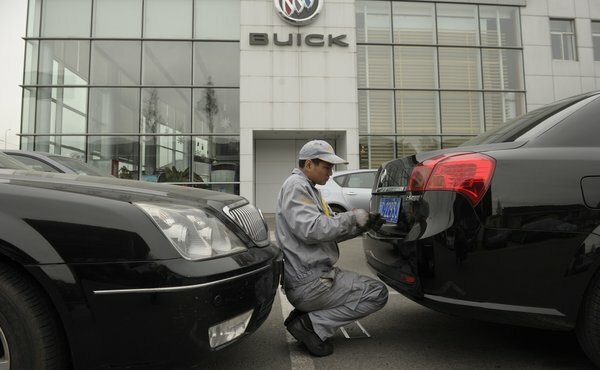 Nevertheless, analysts said the real impact of China's punitive duties on US carmakers would be minor. "This appears to be a retaliatory measure taken by China which only strikes at the margins, since the import car market has a rather small share of the auto market," said Bill Russo, a senior advisor at Booz & Company and the former head of Chrysler's business in China. "Normally, such actions are taken in order to help local manufacturers. However, this makes little sense in this case, as no local manufacturer directly competes in the price segments where imported cars are positioned." General Motors, Ford and Chrysler collectively sold 1.37 million cars in China in the first 10 months of this year, of which more than 95 per cent were made in China, according to data from JD Power and Associates. About 58,000 of those cars were imported, and not all from US plants. "This looks like a case of killing the chicken to frighten the monkey," said Michael Dunne, president of industry consultancy Dunne & Company and author of American Wheels, Chinese Roads: The Story of General Motors in China. "China wants to send a signal to Washington: `See how quickly we can move on your car imports? What if we decided to target Boeing instead?' Now, that would really sting." Chrysler cars account for many of the low export volumes of US-made cars to China, as Chrysler does not have a production presence there. The US car exports affected include Honda America's small-scale imports, a few models under General Motors' Buick and Cadillac brands, and high-end, US-made Mercedes-Benz and BMW SUVs. "GM generally builds where we sell," Shanghai-based spokeswoman Dayna Hart said yesterday. "In fact, GM's import volume out of the US is less than half of 1 per cent of its domestic production in China and is limited to selected Buick and Cadillac models." Ford spokesman Trevor Hale said: "We don't export any vehicles from the US to China. Our entire China vehicle portfolio - except for the Edge [SUV], which is imported from Canada - is built locally." US car exports to China tend to be high-priced, low-volume models whose buyers are wealthy. "Luxury car buyers are typically more affluent and are not going to fret over this extra cost," Samsung Securities car analyst Steve Man said. "We see little or no impact to demand for luxury cars as a result of these new duties." GUANGZHOU, China — The Chinese government increased trade tensions with the Obama administration Wednesday evening by unexpectedly imposing antidumping and antisubsidy tariffs on imports of sport utility vehicles and midsize and large cars from the United States. The new tariffs, totaling up to nearly 22 percent of the import prices, will probably have a mainly symbolic function, rather than reducing the already skimpy sales of such vehicles in China. Other tariffs and taxes already in place have limited sales of American imports by helping raise their retail prices by about three times what the same cars and S.U.V.’s sell for in the United States. Still, firing a trade volley at American exports of automobiles, one of the most politically sensitive industries in international trade, can only escalate trade hostilities between China and the United States. China’s move drew immediate criticism from the Obama administration. The Commerce Ministry of China, which has conducted a two-year trade investigation of the American imports, gave no explanation for its decision to impose the duties. Ministry officials could not be reached for elaboration Wednesday evening. The duties would mainly affect General Motors, which exports Cadillac S.U.V.’s and cars to China; Chrysler, which exports Jeeps; the BMW Group of Germany, which exports BMW S.U.V.’s from South Carolina; and Daimler of Germany, which exports Mercedes S.U.V.’s from a factory in Alabama. The White House announced last week that it would ask the World Trade Organization next Monday to open an inquiry into Chinese restrictions on imports of American broiler chickens. More significantly, Chinese government agencies and companies have been furious about a current American investigation into whether Chinese solar panels exported to the United States might have received illegal subsidies or been dumped in the American market at prices below the cost of manufacturing them. American officials have previously examined the methodology of China’s two-year-old antidumping and antisubsidy investigation of American-made automobiles and have found “significant problems,” said Ms. Guthrie, the United States trade spokeswoman. One challenge for China, which recently celebrated its 10th anniversary as a member of the World Trade Organization, is whether Wednesday’s action will be allowed under W.T.O. rules. The trade organization places many limits on a member nation’s ability to impose antidumping and antisubsidy measures, particularly on goods from countries that the W.T.O. has declared as having market economies, like the United States. “Dumping” might be hard to demonstrate, given that the prices of the American vehicles — even before China’s tariff and tax markups — tend to be higher than in the United States. The Chinese accusation of subsidies may be linked to previous comments by Chinese officials questioning whether the Obama administration provided too much federal assistance to G.M. and Chrysler two years ago during the global financial crisis. China started the automotive trade case two days after President Obama imposed steep tariffs on surging imports of Chinese tires in September 2009. After an inquiry, the W.T.O. ruled this autumn that the American tariffs on tire imports had complied with international trade rules. The new tariffs China imposed Wednesday will be antidumping duties of 8.9 percent for G.M. vehicles, 8.8 percent for Chrysler, 2.7 percent for Daimler and 2 percent for BMW. The ministry separately imposed additional antisubsidy duties of 12.9 percent for G.M. and 6.2 percent for Chrysler. The ministry’s statement said that all of the new duties would be calculated on vehicle prices that include China’s existing 25 percent import tariff for all family vehicles. So buyers will effectively pay the new antidumping and antisubsidy taxes on other Chinese taxes in addition to paying the new taxes on the value of the car. China’s import tariff is much higher than those of other big auto manufacturing nations. The United States, for example, assesses a tariff of 2.5 percent on imported cars, minivans and S.U.V.’s. The new Chinese duties will apply to sport utility vehicles and cars with engines of 2.5 liters or greater that are imported from the United States. The duties will be in place for two years, through Dec. 14, 2013, according to the ministry’s announcement. BMW said that it anticipated little effect from the duties, Daimler said that it was studying them, and Chrysler had no immediate comment. By contrast, Chrysler’s sales in China are solely imports. The company was not allocated any factories in China when Daimler dissolved its merger with Chrysler in 2007. As a result, Chrysler’s sales in China are tiny — only 13,686 Jeeps, 10,970 Dodges and 284 Chryslers in the first 10 months of this year, according to LMC Automotive, a British consulting firm. Bill Russo, a former Chrysler executive who oversaw the company’s operations in China until 2008 and is now an industry consultant in Beijing, said in a telephone interview Wednesday evening that while some Chinese trade actions might benefit Chinese industries, it was unlikely that the latest move was done to help Chinese automakers. Imported models already cost much more in China compared with their home markets because of steep Chinese tariffs, value-added taxes and a system of sales taxes that range from 1 percent on fuel-sipping subcompacts to 40 percent on large sport utility vehicles and sports cars. The Chinese Commerce Ministry’s announcement on Wednesday was the latest in a series of zigzags on trade policy this autumn, as Chinese officials have struggled over how confrontational a stance to take now that the Obama administration has begun to challenge Chinese trade policies more aggressively. Just three days ago, President Hu Jintao gave a conciliatory speech to observe China’s W.T.O. anniversary. Mr. Hu said that China would further open up its international trade. But last week, the Commerce Ministry strongly criticized a recent preliminary decision by the United States International Trade Commission, which concluded that imports of Chinese solar panels had hurt American solar panel manufacturers. That decision moves the United States one step closer to imposing antidumping and antisubsidy duties on Chinese solar panels early next year.